Kincaid's lupine flowering at Fir Butte. Kincaid's lupine (Lupinus oreganus), a rare species native to prairies of western Oregon and southwestern Washington, is a host for the endangered Fender's blue butterfly (Icaricia icarioides fenderi). 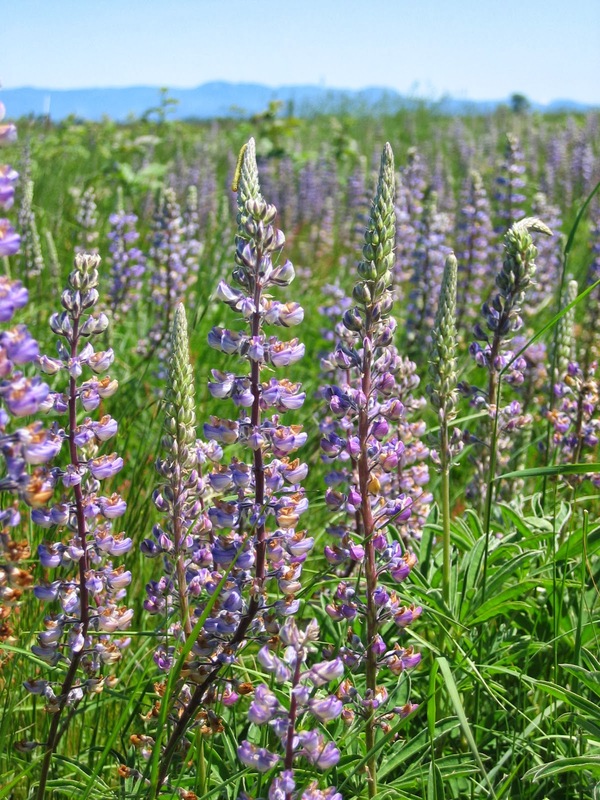 As such, Kincaid's lupine has become the focus of restoration efforts throughout its range. Populations are generally found on private, unprotected land, and face a variety of threats including habitat loss due to human development. In order to ensure the survival of the Kincaid's lupine and Fender's blue butterfly, it is imperative that we establish new populations on protected lands. Flowering lupine in a warming treatment at the common garden. Among the possible challenges to conserving these species is global climate change. While climate models predict hotter, drier summers and wetter winters in the Pacific Northwest, it is necessary to understand the effects these changes will have on rare and endangered species. To address these questions, we used an experimental common garden to test for interactions between genotype and microclimate to identify management considerations which may be necessary for long-term adaptation to climate change. Warming plot with covered frame. The common garden consisted of three treatments (ten of each for a total of 30 plots), intended to simulate past, present, and future climate change conditions. Ambient plots consisted of a 10 ft square plot with no climate manipulation. Shading and warming plots consisted of 10'x10'x3' frames covered with permeable shade cloth and 4mm greenhouse plastic, respectively. One-inch holes were cut in plastic sheeting to allow for precipitation. In April of 2012, 959 plugs were planted at the common garden site from eight seed sources located throughout the range of Kincaid's lupine. Later in 2012, seed from an additional Washington site was collected, propagated, and those 120 plugs were planted in April of 2013. Individuals were planted on a 6'x6' grid within each plot. Shading plot with covered frame. At each plot we monitored temperature, relative humidity, and precipitation. Plants were monitored in June of 2012 and 2013 for growth (height and number of leaves), reproductive effort, and survivorship. In 2013, we found that seed source had an effect on all responses measured: the height of Kincaid’s lupine, number of leaves, and survivorship. We even saw differences among seed sources early in the phenology of the plant where various sources germinated at different times, as well as differences in reproductive effort among seed sources. In addition, number of leaves was dependent upon not only seed source but also experimental treatment, though not the interaction of the two factors. These results suggest that Kincaid’s lupine has phenotypic variability between seed sources, but also indicates potential to thrive under conditions that maximize those traits. Data from one more year will enable us to see if treatment effects become more evident, and if experimental treatments affect Kincaid's lupine phenology (dates of re-emergence and flowering times). This information will be valuable for efforts centered around the conservation of Fender’s blue butterfly and its need for host plants under projected climate conditions. Beyond experimental success, this project is a story of success in community volunteer efforts. Volunteers took part in all stages of the experiment, including site design and construction, propagation, out-planting, site maintenance, weeding, watering, and precipitation monitoring. This project has thus far seen a total of 101 volunteers contributing over 412 volunteer hours. Every one of these volunteers offered significant contributions to the study, while also actively participating in and learning about conservation and restoration efforts associated with rare and endangered species. This project has been a successful community outreach and education effort and we are excited for future volunteer contributions. We thank all of our volunteers who have donated their time to this study. Top Left: City of Corvallis Youth Volunteer Corps. Top Right: Ecological Education Coordinator Larkin Guenther helping South Albany High School students monitor lupine. Bottom Left: Youth Volunteer Corps helping to weed the treatment plots. Bottom Right: Long-term volunteer Mario Carbajal setting up plots in the snow. If you are interested in volunteering on this or other projects, please contact IAE at 541-753-3099 and find us on facebook. - Võng điện tự động hay võng điện cho bé là một món quà vô cùng ý nghĩa cho bé yêu của bạn, giúp cho các bé có giấc ngủ ngon hơn mà không tốn sức ru võng của bố mẹ. - Võng tự động chắc chắn, gọn gàng, dễ tháo xếp, dễ di chuyển và dễ dàng bảo quản. Những lợi ích mà may dua vong tu dong loai nao tot mang lại là vô cùng thiết thực, võng điện cho em bé đang là lựa chọn hàng đầu trong việc chăm sóc con của các ông bố bà mẹ bận rộn. - Hiện nay trên thị trường có nhiều loại dua vong tu dong cho bé, chúng tôi nhận thấy máy đưa võng tự động TS – sản phẩm máy đưa võng tự động thiết kế dành riêng cho em bé, có chất lượng rất tốt, hoạt động êm, ổn định sức đưa đều, không giật cục, và vong dua tu dong tuyệt đối an toàn cho trẻ, đảm bảo trẻ ngủ thật ngon giấc. Và bạn có thể tìm mua sản phẩm máy đưa võng tự động TS giá rẻ đảm bảo chất lượng, uy tín cao tại máy đưa võng tự động An Thái Sơn – địa chỉ bán máy đưa võng tốt nhất, uy tín nhất.